The opposite of a contrail is a “distrail”. When a jet flies through a high cloud then various factors to do with the passage of the jet are sufficient to trigger precipitation in the cloud, leaving holes or trails. The precipitation can spread outwards quite a distance. This is a satellite image over Texas. 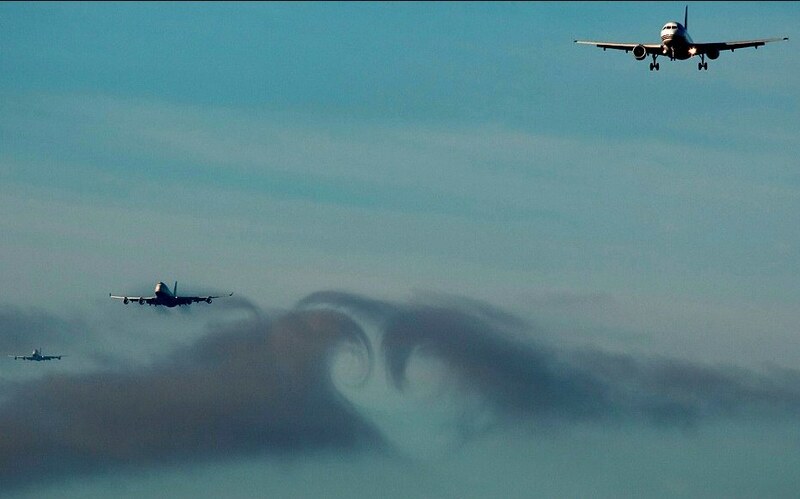 Holes form when the plane is climbing or descending through the cloud. The longer trails form when a plane flies at about cloud height for a while. Here’s another example from North Texas, and a picture of what these hole shaped distrails look like from below. 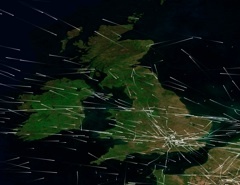 The distrails are caused by the sinking air that EVERY aircraft creates as a result of the creation of lift. Sometimes a jet can clear the approach for the jet behind it by disturbing the air and pushing any cloud or fog out of the way as it descends on the approach and then goes missed. The jet behind it now has a clearing and can make it in. It’s rare but I’ve heard it happen. By “goes missed” do you mean they don’t land because of poor visibility? Yes- I might go missed once or twice a year. No big deal to us up front but it can be disturbing to those in back. Large power/pitch changes close to the ground. It really almost never clears the way for the guy behind you but supposedly every so often if the conditions are right you might make a little hole for him. It’s not just the sinking air that causes the holes and streaks in the above image though, it’s the supercooled water glaciating. It’s initially in a fairly stable state as a layer of cloud in the form of supercooled water droplets, then something happens (like a plane flying thorough, or above it), which triggers cascading glaciation of ice, which triggers more glaciation, creating the holes. 4.3.5 Fallstreak holes are produced in a thin layer of supercooled cloud when glaciation begins at isolated points, from which it spreads outwards. The crystals fall so as to form a horn-shaped surface with the first crystals falling from the centre at the bottom of a streak which widens upwards. The glaciation is thought to spread through a cloud by means of the small splinters of ice ejected from a droplet which has grown a shell of ice on its outside first and is then shattered when the water inside also freezes and expands. The splinters cause the freezing of other droplets with which they make contact. It is usually uncertain how the original glaciation is localised at a few points. Most probably it is initiated by the passage of an aircraft, for at low temperatures droplets become frozen, and probably shattered, on contact with the cold aircraft surface. There may also be low pressure regions around the aircraft where the air is cooled to —40°C or below long enough for glaciation of the cloud droplets to occur spontaneously. 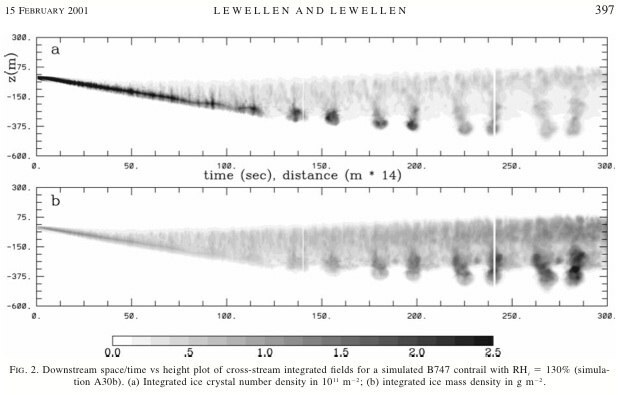 Another possibility is that the holes were started by crystals falling from isolated fall streaks above the layer. Interesting to picture all those frozen droplets freezing and exploding, shooting shards into other droplets, which makes them freeze. I think that may be the case in a few situations but I think the vast majority of distrails is simply the plane pushing the airmass down (and the cloud contained in that airmass) and reversing the process in which the cloud was made in the first place- like cloud degeneration. Same thing as when a standing lenticular goes back down on the downwind side of a mountain. I think the last pic you posted describes the process you cited. That seems more like the cloud free air from above is simply pushing the cloud apart, rather than down. However, I think the satellite photos above actually show the same process as the last photo. It’s a layer of supercooled cloud, and the passing aircraft make it precipitate out. The width of the trail is far too big to simply be the wake of the aircraft. The wake simply seeds the initial glaciation. Interesting, I never really thought too deeply about airplane wakes. Especially in the context of spreading outward AND downward, in an almost cone shaped manner behind and below the airplane. Does this sound right? I wonder, generally, what the “effective” range of an airplane wakes is, and how far down they can extend? By effective, I mean, disturbs the air enough to change cloud shape into distrail. Airplane wakes are a good part of the reason we’re talking here! First, think of how a plane stays aloft. They’re not called air”planes” on accident. The wings act as a plane to push air down. Consequently the plane is “pushed” up. Sure Bernoulli plays a part but Newton has his hand in this to a greater extent. Now picture the mass of a 777 for example. To hold all of that mass up your going to have displace an equal amount of mass of air molecules. The air molecules hit the wing, are deflected downward and the plane is lifted. You just don;t often think of it that way because we discuss lift in terms of pressures but the concept is still all there. Of course around the wing tips there’s some high pressure beneath the wing trying to escape to the low pressure above the wing and since the wing is in motion this escape path become twisted (a wing-tip vortice). So now you have a wingspan width area of air that was just pushed down with a huge force. This air drops rapidly at first but since air molecules don’t have much mass they also don’t carry much inertia so they’re rate of descent slows fairly rapidly. They do, however, continue to fall for quite some time. This is the basis for much of what we consider when planning to avoid wake turbulence. If there is a contrail associated with the wake the planning is easy- don’t fly through the contrail. But most of the time it’s not visible so we simply avoid flying under the path of a previous aircraft. Obviously we can’t often keep track of where the previous planes have been so ATC keeps some seperation for us and I’ve also been “waked” a few times just because. The interesting thing to watch as you fly parrallel to a contrail is seeing how the different parts of that trail sink at different rates. Also the wing tip vortices tend to hold together very well for longer than you would expect and leave two very long perfect tubes (probably no wider then 30 ft. or so) that tend to not sink as fast as the core of the wake. 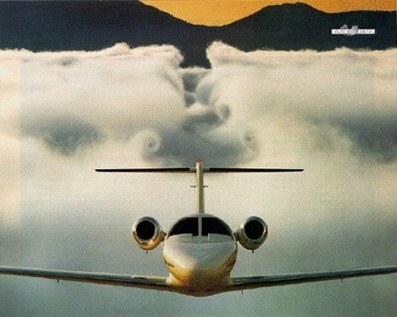 The jet exhaust portion generally gets pushed down, out and wraps around itself as it rapidly mixes and distorts. This whole process also depends on the level of turbulence in that area. If it’s rough things get mixed together pretty quickly, smooth air tends to hold the initial form better. I suspect this is the reason so many claim to see “drippy” “chemtrails”. Parts of the contrail are sinking faster then other parts and it tends to make the trail stretch out vertically. Please no one call me out on the explanation of lift- I really oversimplified things to keep the post from being a mile long! Carry on…. The above plane is not leaving a contrail. But it’s interesting that it seems to be leaving a white trail caused by the vortices sucking in the cloud layer. A “vortrail”? I think it is called the crow instability?? …when the vortex spins the contrails? I used to run Barons out of MEM and we used to hear the vortices from the FedEx heavies hitting the roof of our offices almost every night. It was strange at first because it sounds like someone gently flapping a mylar sheet. Kind of a wierd thrushing noise that lasts a few seconds. 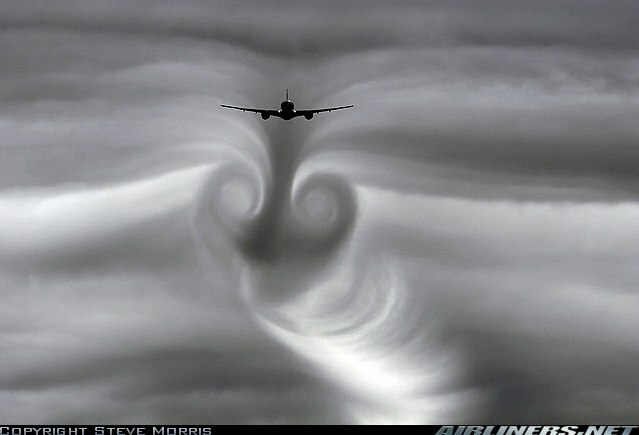 We could often feel the vortex as it swept across the ramp. Uncinus- the pic of the 777 is him transitioning from the top of that thin layer to underneath it. 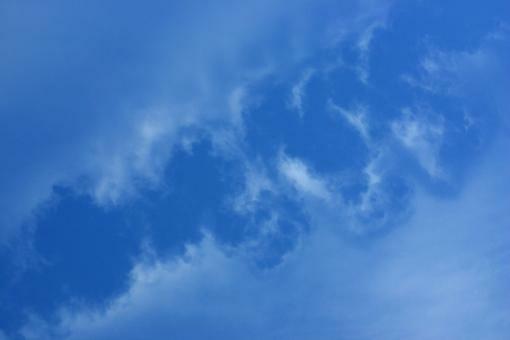 The white area is very thin as the cloud is seperated due to the downward and outward rotation of the vortices. The dark heart shape is him actually busting through and the bulge above the heart pointing down is the result of the vacuum created during lift. We used to go out in our trainers and bust through clouds all the time, manipulating the tops, bottoms and sides of the clouds just for fun. We could bust up a few small clouds simply by flying through them. Those videos reminded me of that. And that reminds me of this, from Flight magazine, August 15, 1940 – seventy years ago. I have on several occasions completely “removed” small cumulus clouds which had passed the “waxing stage” and were on the “wane” by diving through them several times. In this way a cloud which would normally take an hour to disperse can be dispersed in five minutes or less. The reason would be, I suppose, merely that any stirring up or mixing will accelerate any physical process already in action in the cloud. Similarly an aircraft can cut a path through a thin cloud, leaving	a blue ” lane”	with	clearly marked vortices on	each side. Another interesting photo of how a distrail is created. That’s one type of distrail – a low level thin cloud layer that is basically pushed out of the way by the jet. The distrails in the satellite photos at the top seem to be mostly the glaciation type.